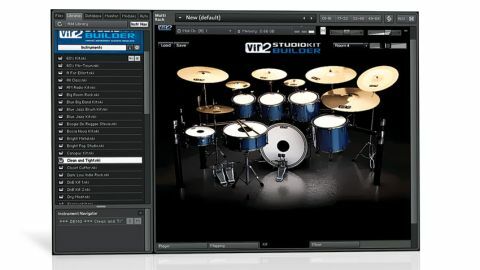 Studio Kit Builder offers a solid 6GB of quality sample content, and while there's nothing particularly unusual on offer, the package represents decent value for those who require virtual drums. Massive library. Hugely flexible. Great sounds, if you're prepared to work for them. Can't quickly audition kits using same MIDI pattern. Billing itself as "the most complete encyclopedia of acoustic drum kits ever collected into one product", Studio Kit Builder is one step beyond your average Kontakt drum library. "You can customise the supplied kits by swapping individual drums, and stylistically, they cater to everything from swingin' jazz (brushes included) to ear-bleeding metal"
Upon loading it in Kontakt or the supplied Kontakt Player, you're presented with a whopping 54 kits, constructed from 130 acoustic drums. You can customise the supplied kits by swapping individual drums, and stylistically, they cater to everything from swingin' jazz (brushes included) to ear-bleeding metal. Each drum has its own velocity curve, polyphony, pitch, humanisation and amplitude envelope settings. What's more, the instrument has a full mixer page comprising kick, two snare, four tom and hi-hat channels, plus direct, overhead mic, room mic and master busses. You also get reverb, chorus, delay and flanger send effects, and each channel buss gets its own dedicated effects chain: transient processor, EQ, compressor, stereo spread, saturator and limiter. There's a comprehensive mapping page, plus a 'Player' with a selection of MIDI drum parts covering a wide variety of genres that you can drag and drop onto a MIDI track in your DAW. The downside is that you can't quickly audition drum kits using the same MIDI pattern, although you can work around that limitation by dragging the pattern you want to hear onto a MIDI track before you start cycling through the kits. Like BFD2 or Superior Drummer 2.0, you'll need to do a little mix work to get the best results. The pay-off is that there's loads of flexibility, if you're prepared to put the work in, and if you prefer to work with Kontakt, you'll be very comfortable here.